Beautiful day in the forest, you’ve got full basket of ingredients for the best Yakitori stylized picnic in your life with your friends! But oh snoop, of course Klutz forgot to pack brand new skewers! 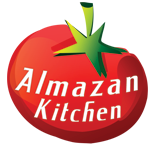 Not a big deal for the AlmazanKitchen Forest Crew! Just take the knife and make your own kushi-skewers while our cozy hoodie keeps you comfortable all the time! Yap, like this, now we’re ready for it! Aroma chicken thighs and veggies grilled on coals, seasoned with simple yet fascinating salty-sweet sauce! Remove bonesand all non-meat parts from the chicken thighs (check our video to learn how to do it). Cut into medium slices. Skewer it up. Slice zucchini into rounds, skewer it up. Preheat the pan, melt 2 tbsp. of caramelized sugar in it. Add 2 tbsp. of soy sauce and 1 tbsp. of vinegar, slow cook until rich saucy consistency. Build special Yakitori oven using campfire and 2 halves of one log. Grill skewered ingredients until veggies are crispy golden brown and meat is ready. Sprinkle skewers with lemon juicy. Cover skewers with salty-sweet sauce well! Your presentation and food prep was so basic yet elegant, The food looked like it tasted phenomenally. Kudos . I must get that kitchen knife. Hello there friend! Thank you for following our channel! We’re glad you like what we do that much, it means really a lot! Please contact us via personal message on our Facebook group regarding our items for sale. Cheers! Thank you so much. Amazing foods.I’d like to cook some foods in your site. And i introduce to my blog this recipe and pics. Thanks.